Jordan Flores showed glimpses of genuine class in his debut in the starting lineup. Gary Caldwell was right about that. Some two thirds of the way through the match the Latics had started to flag. The early intensity and running off the ball had dissipated and it came as no real surprise when Leon Clarke headed his first goal from a left wing cross in the 63rd minute. Neither was Clarke’s second goal in the 89th minute as Bury had continued to threaten. Caldwell fielded a 4-3-3 formation, akin to those of the Uwe Rosler era. Kevin McNaughton started at right back, with Leon Barnett partnering Craig Morgan in the centre of defence and Reece James on the left. Max Power, David Perkins and Jordan Flores made up the midfield, with Will Grigg at centre forward, Sanmi Odelusi on the right wing and Michael Jacobs on the left. 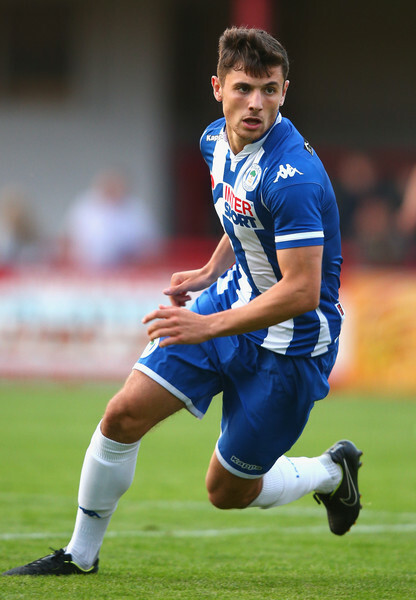 Wigan looked lively in the first half, with Jacobs marauding inside from the left, willing to take on defenders. However, the most clear cut chance came in the 33rd minute when Flores went on a long run from the half way line, rounding goalkeeper Walton in the six yard box before the keeper recovered to parry his shot. There was lots of running off the ball, with the players full of effort and commitment, but not surprisingly the players appeared to lack that telepathy which guides the final pass. One wonders if Caldwell had told his players to make a point of running at the Bury defence as Jacobs did that straight from the kick off in the second half. He was upended in the box and Grigg hit home the penalty. It will do the centre forward a world of good, getting off the mark. He had been lively throughout and was soon to pull the ball back for Odelusi who spooned over the bar with the goal gaping. Bury had by no means played badly by that stage. They were well organised and had played some good football. As the game moved on they looked so much more physically stronger than Wigan. Following Clarke’s first goal Latics had a throw in on the left hand side, at the half way line. There were four players close to the ball but not one made a run to receive it. The result was a short throw being made and Latics losing the ball. So many players had seemed to run out of steam with one third of the game still left. Caldwell brought on Ryan Jennings after 70 minutes to replace the ineffective Odelusi. Grigg went off 8 minutes later for Craig Davies to enter. But neither substitution was to breathe further life into Wigan’s play. The substitution of Billy Mckay for Flores in the second minute of time added on seemed pointless, but somehow reminiscent of the treatment the Northern Ireland international received from Malky Mackay. But there were positives for Wigan. Perkins shone, once again being the standout player. At 33 years of age he seemed to have the legs that his younger teammates lacked, covering acres of ground, solid in defence and with good distribution. Jacobs looks a good signing, with his willingness to take defenders on and to shoot. He has pace and determination. There were signs that Grigg and Jacobs will make a formidable pairing up front as their understanding of each other’s games improves. Both have skill has commitment and have enjoyed previous successes in League 1. McNaughton looked like an accomplished player throughout and will surely stake a claim for a regular starting berth. James performed well on the other flank. Flores had a starting debut to remember, showing silky touches of genuine class, including that superb run on goal in the first half. Like any young player still learning the game, there were times when he switched off and made mistakes and by the end of the game he looked exhausted. Caldwell will have to decide how to develop the 19 year old further, whether to carefully nurture him within the club or to send him out on loan where he will get more game time. At any rate, Latics have got a player for the future in the Wigan lad who has a Spanish father and English mother. It will be interesting to see if Caldwell sticks with 4-3-3 for the Doncaster match on Sunday. The centre of defence looked vulnerable to high balls in the second half and it led to two goals. Against teams with big, physically imposing forwards he might well opt for a line of three central defenders, including the powerful Donervon Daniels, who was on the bench last night. Moreover the return of Jason Pearce will surely strengthen the centre of defence. If Caldwell opts for three at the back it is to be hoped that he will play a 3-5-2 formation, rather than a 3-5-1-1 which leaves the centre forward isolated. A home defeat to a team just promoted from League 2 can hardly be looked upon as a success. But few fans will bemoan an exit from a League Cup competition that adds extra games to a season that is already long and arduous. Fans can accept last night’s result to some degree, knowing that Caldwell’s new team is a work in progress and the players need more game time together to develop that mutual understanding which enables good team play. What is hard to accept or understand is why Bury looked so much fitter than Latics. The conspiracy theorists might say that Caldwell was not really interested in the League Cup and the players’ performances in the final third of the game reflected that. But the more likely explanation is that the visitors were simply physically fitter than Wigan. Last year’s start of the season was marred by a disastrous pre-season programme that left the players largely unfit. Changes were clearly made this year, but the players still do not look fully fit. At the final pre-season match at Blackburn, Caldwell surprisingly made eight substitutions. Of the starting eleven at Coventry only three – Morgan, Perkins and Power – played the full 90 minutes at Blackburn. The fitness issue at the beginning of the season goes back to Owen Coyle’s days. One can only hope that the people in charge of the physical preparation of the players at the club are getting it right this time around. The Doncaster game will provide not only a glimpse into whether the players are starting to meld together as a team, but also whether they can match their opponents physically. The first half and the beginning of the second half show that the team is beginning to form, which can only be a good thing. Plus the performance of Jordan Flores and the debut of Ryan Jennings are two massive positives. So far I hadn’t heard much from Flores to suggest he was as bright a talent as Jennings, but this performance is a great sign. However the team being in bad physical shape is not a good sign. This should get better, and at least at the beginning of the season the team is putting in some decent performances with good football – they weren’t last season. It might be a good idea to go for a 3-4-1-2 formation with both Junior and Perkins in defensive midfield to solid things up a bit. I’ll keep the faith – little by little I’m sure things will start to take shape.